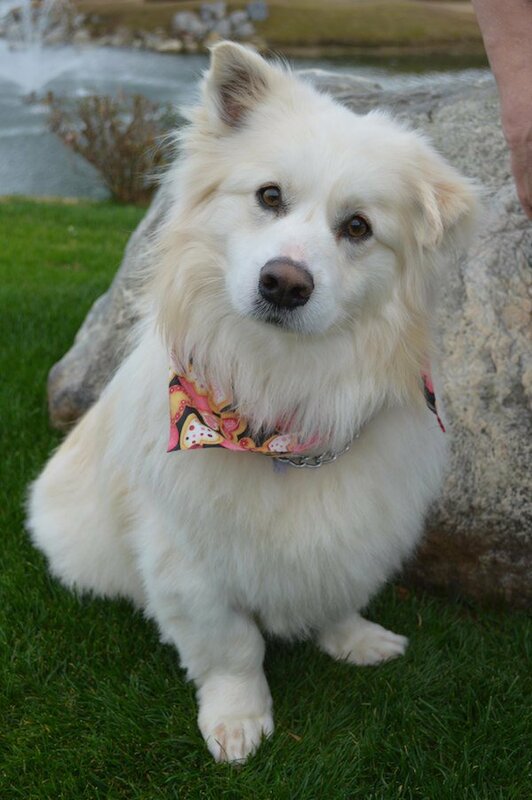 Buddy the dog was abandoned in a large agricultural field in Bakersfield, California. Every day, he would sit in the middle of the field like he was waiting for someone to come back for him. He lived in the field for 5 months before a kind-hearted woman took it upon herself to save him! Annette was visiting her sister when she learned about Buddy. As soon as she heard, she knew had to try and rescue him. Annette wrote how she successfully saved Buddy on DogFull.com. “This is the story of Buddy. I learned about him while visiting family in Bakersfield earlier this month when my sister, an animal advocate, showed me a video story that a local television news station had produced about a white dog that had been abandoned in an agricultural field in Bakersfield. The video was dated November 2012. She told me that the dog was still out in that field. I couldn’t believe that I was being shown a video that was two months old and the dog had not been rescued yet. Buddy had been sitting in the middle of the field, day after day, like he was waiting for someone to come back for him. People said they had seen him in the field as early as August 2012. No one ever came back for him. When the local television station did their story on Buddy several people tried to catch him by doing crazy things like trying to throw a net over him and chasing him in all-terrain vehicles, which terrorized him. 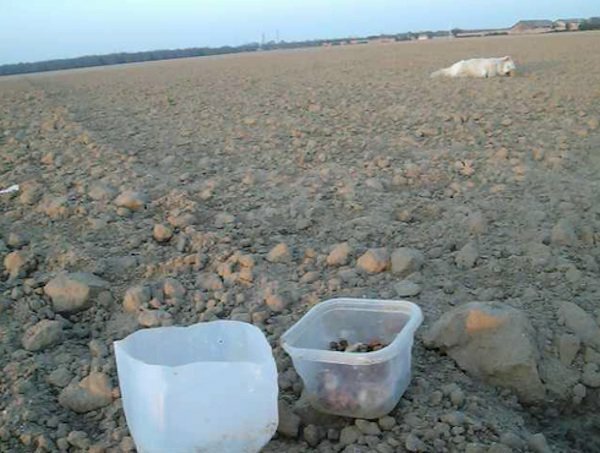 People left food and water for Buddy in the field for months. When I heard about Buddy, I told my sister I would try and rescue him. I had watched many Hope For Paws animal rescue videos. I decided to use some of the strategies I had seen in their videos. I came armed with hamburgers. It took me 7 ½ hours over the course of 2 days to catch Buddy. Day 1: I was able to walk within 20 feet of him then I would sit down in the dirt and scoot toward him a little at a time to get closer. I would talk and sing to him in a calming manner. I would get within a few feet of him and toss him some hamburger. When I would get too close he would get up and move away. I would start the approach and scoot toward him over and over again. I scooted around in the dirt in that field for 4 ½ hours and by the end of the day I was within an arm’s reach of him and had him eating out of my hand. I knew if I lunged at him, I would scare him and lost the trust I had built. So, I decided to return the next day. I took away the food that had been left for him by others, leaving only water. I wanted him to be hungry when I returned the next morning. Day 2: Rain was in the forecast for that night so I was determined to catch him. I was armed with weiners and chicken. I approached him like I had the day before. I walked near to him, sat in the dirt and began scooting toward him and talking to him. He was hungry and came to me, eating out of my hand, but he was still tentative. I saw that he had a collar so I decided that I was going to have to grab him because he was not going to stay still and let me attach a leash. Grabbing him and scaring him was not the way I would have wanted to catch him, but I didn’t have a better choice. He was not cooperative when I tried to lead him on the leash out of the field. I had two leashes on him, both mesh, and he chewed clear through one and partially through the other. He was too heavy to carry through the field so I called for back-up. I needed better leashes that Buddy couldn’t chew through and help to get Buddy out of the field. He was fighting the leash. Help arrived and we slowly led him out of the field. He chewed through a third leash in the process. By the time we got him to the edge of the field he was exhausted. Watch the rescue below. We took him in for an exam and the vet estimates he is a couple of years old. I could not believe that he had spent 25% of his life living in that field! He did have matted hair and had barbed wire wrapped around his tail and matted into his fur, but was otherwise in good health. Buddy wagged his tail the day of his rescue and slept a lot for several days after. Life on the streets is hard on a dog and they do not rest. Buddy has now been placed in a foster home to learn to trust people again and to be socialized. Buddy did get his happy ending! He was adopted by his foster family shortly after his rescue!